West Windsor, N.J. – Mercer County Community College’s (MCCC’s) Academic Theatre Company will present an original adaptation of Shakespeare's classic “A Midsummer Night's Dream” at Kelsey Theatre. Dates and show times are Fridays, April 1 and 8 at 8 p.m.; Saturdays, April 2 and 9 at 8 p.m.; and Sundays, April 3 and 10 at 2 p.m. Kelsey Theatre is located on the college’s West Windsor Campus, 1200 Old Trenton Road. The play features all of Shakespeare's comic and fantastical fairy elements and characters, but adds American jazz dance fused with classical Indian dance. Audiences can expect to experience the play as an electrifying Bollywood-inspired production fused with Shakespeare and jazz. According to MCCC Theatre/Dance Program Coordinator Jody Gazenbeek-Person, the program strives to give students and their audiences a diverse range of theater experiences. This year’s academic focus is classical Indian drama and dance. Students are reading India's classical plays, such as Śūdraka's Little Clay Cart, Kālidāsa's Śakuntalā and Mālavikā and Agnimitra, as well as The Nātyaśāstra, one of the earliest and best treatises on Indian dramaturgy, music and dance. Supplemental materials include scholarly works on Indian stagecraft and performing. With the help of a consultant, the actors are rigorously rehearsing a variety of hand gestures and other techniques that they will make breath-taking on stage. “But our students will know that the gestures they are performing date back over 2,000 years. They will have a powerful learning experience, while audiences will leave the theater laughing, mesmerized by the dancing, and hopefully wanting to know more about India's rich performance traditions,“ Gazenbeek-Person said. The cast features: Charles Acuna of Plainsboro as Puck; Amy Annucci of Ewing as Moth; Katherine Beauchamps of Ewing as Fairy/Philostrate; Krista Coleman of Hillsborough as Hippolyta/Fairy; Robert Gray of Ewing as Theseus; Kasiah Harrison of Lawrenceville as the Fairy/Attendant; Harley Herrell of East Windsor as Tom Snout/Wall; Kimberly King of Hamilton as Cobweb; Jessica Klatskin of East Windsor as Mustardseed; Kyle Kington of Florence as Demetrius; Madison Kotnarowski of Hamilton as Helena; Kourtney Laws of Trenton as Fairy/Votaress; Brian Tudor Leeds of Edgewater Park as Nick Bottom/Pyramus; Rachel Lemos of Lawrenceville as Titania; Shelley Gail Weiss Lightman of East Windsor as Attendant; Meaghan Lukacs of Hamilton as Hermia; Teewhy Nyema of Trenton as Peter Quince; Adam Porcher of Hopewell as Francis Flute/Thisby; Marius Price of Ewing as Lysander; Brianna Rapp of East Windsor as Peaseblossom; Christopher Ryan of Trenton as Oberon; Brian Sheppard of Lawrenceville as Starveling/Moon/Attendant; Calla Tisdale of West Windsor as Attendant; and Matt Tucci of Ewing as Egeus/Snug. The production team includes Producer/Choreographer Jody Gazenbeek-Person, Producer Kitty Getlik, Director Lou Stalsworth, Costume/Set Designer Kate Pinner, Lighting Designer Bob Terrano, Master Carpenter Jim Petro, Sound Designer Frank McDuff, Props Mistress Madelyn Lichtman, Vocal Coach Rupert Hinton, Stage Manager Nicole Schulnick and Assistant Stage Manager Jon Cintron. MCCC's Entertainment Technology students will do lighting and sound. Tickets may be purchased online or by calling the Kelsey Box Office at 609-570-3333. Kelsey Theatre is wheelchair accessible, with free parking available next to the theater. For a complete listing of adult and children's events, visit the Kelsey website or call the box office for a brochure. 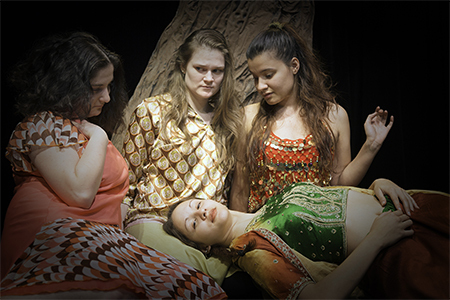 Seated from left, Meaghan Lukas as Hermia, Madison Kotnarowski as Helena, Rachel Lemos as Titania and Katherine Beauchamps as a Fairy. Photo by Robert A. Terrano Photography. 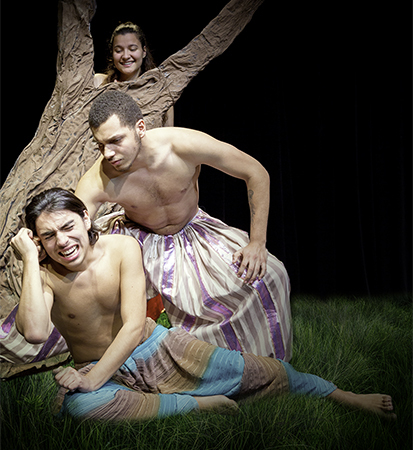 Oberon (Christopher Ryan, standing at center) disciplines Puck (Charles Acuna), while Titania (Rachel Lemos) looks on. Photo by Robert A. Terrano Photography. 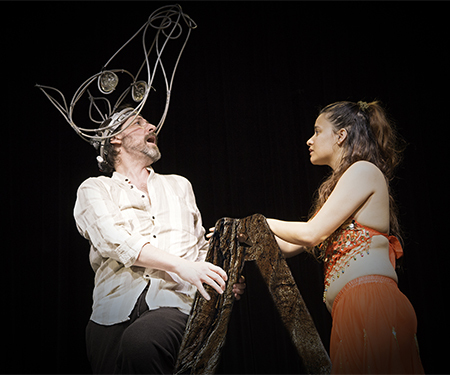 Brian Tudor Leeds as Nick Bottom and Rachel Lemos as Titania. Photo by Robert A. Terrano Photography. 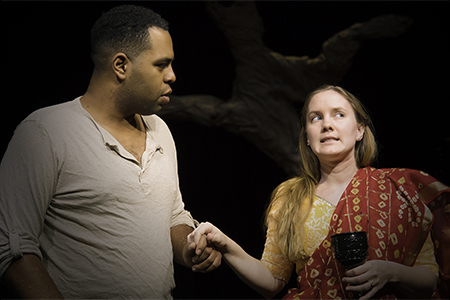 Robert Gray as Theseus and Krista Coleman as Hippolyta. Photo by Robert A. Terrano Photography.